Copperhead: Another snake you’ll find along swamplands and wet woodlands is the copperhead, a snake that usually doesn’t offer enough venom to fatally wound an adult human but can pump enough into your pet cat or dog to cause death. 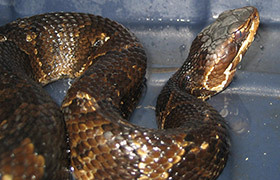 The toxicity and volume is relatively low level compared to other venomous snakes of North Carolina but can still cause difficulty in breathing, dizziness, unconsciousness, headaches, vomiting, necrosis at the bites site, and more. 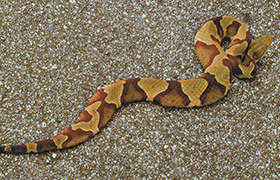 The copperhead is commonly misidentified in North Carolina, often by snakes such as water snakes or corn snakes. Cottonmouth (Water Moccasin): You’ll known if you’ve come face to face with a cottonmouth snake, also known as a water moccasin, because it’ll open its mouth wide and display a white inner lining, giving it the name. It’s a relatively common snake and one that’s proving to be quite dangerous too, with a venom hemotoxic to humans, killing red blood cells and leading to tissue damage as well as internal bleeding. Commonly confused with the Florida green water, brown and brown water snakes so if you see a large, dark grey / green / brown snake with a faint diamond-shaped pattern running along the back, usually swelling close to water, you should leave it well alone. You don’t want to get the chance to see the white inner lining of its mouth. 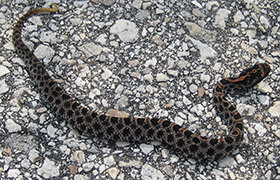 Pigmy Rattlesnake: Another snake often known by a few different names, the pygmy rattlesnake, pygmy rattler, dusky pink rattlesnake and even ground rattler is a short snake, growing to just about thirty inches in length. Although quite an aggressive species, one that will attack at the slightest hint of danger or threat, the bites are very rarely fatal to humans although can be dangerous to children, causing the same hemotoxic problems as the venom from the cottonmouth snake. Coral Snake: You probably won’t encounter this venomous snake of North Carolina because it is one of the rarest, usually spotted only in the southeastern and south regions of the state. They are quite common but also quite secretive, meaning they’ll be more likely to slither away and hide than try to bite you which is lucky because they can pack quite a potent venom in their bite. More good news follows when you learn the coral snake also has very short fangs which do not make it easy to bite through human flesh, only growing to about 3cm in height. This is quite a difference from some species of rattlesnake which can have fangs over half an inch in length. Despite having small fangs, you should avoid the coral snake because of the highly potent venom, more potent than any other state in America. 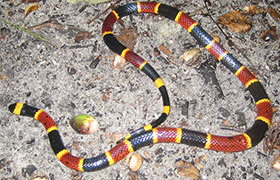 Studies have shown that twenty percent of all human bites from a coral snake are fatal. Eastern Diamondback Rattlesnake: Although you will rarely see an eastern diamondback rattlesnake measuring in any longer than five feet long, they can grow to over eight feet and are known to be the largest and the most dangerous of all venomous snakes of North Carolina. Generally found in vegetation and thick brush, it’s a snake that prefers drier habitats over wetlands and can be spotted in forest-bordering brushy fields and also pine flatbeds although sightings are becoming more and more rare. 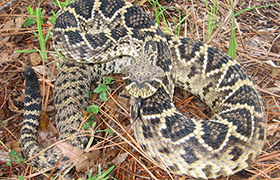 Also known as the timber rattler or timber rattlesnake, the canebrake rattlesnake prefers more uninhabited and quiet areas than suburban ones, making its home in swamps, edges of woodlands, rocky hillsides and fields. You’ll also find them quite difficult to find because they are nocturnal, more active during summer than winter like most other species, but they have been known to come out during the day to hunt for prey. For more information, go to my Snake Removal - How to Get Rid of Snakes home page, and learn more about how to get rid of the poisonous snakes of North Carolina.